The Eden's Orphanage Charitable Trust was founded in August 1872 by James Eden, senior partner in the bleaching firm Eden and Thwaites. At his death on April 23rd 1874, Eden left the sum of £10,000 to the Trust for the building of a home for destitute infant children from within the area of the Bolton Poor law Union, both of whose parents were dead. A further £40,000 was left to be invested, with the income used for the maintenance of the orphanage, the support and clothing of the children, and the payment of the wages and the support of the matron, schoolmasters, and schoolmistresses. Eden also donated a plot of land for the orphanage on Thorns Toad, Astley Bridge. The new building, designed by J.J. Bradshaw, was opened in 1879. Later additions included a new lodge and separate school building in 1884, and a gymnasium in 1889. 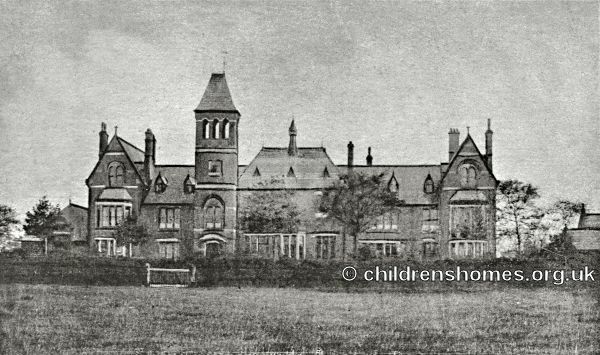 A detached infirmary was added in 1890 after an outbreak of scarlet fever had necessitated some of the children being temporarily housed at the workhouse and the Borough Hospital. The orphanage site is shown on the 1937 map below. Eden's Orphanage site, Bolton, c.1937. The orphanage is a brick building of three storeys, facing north. The eastern half contains on the ground floor a large entrance-hall, the superintendent's dining-room and the board-room in front, the gymnasium at the end and the boys' day-room behind, and the western half contains a large dining-hall in front with two kitchens and a scullery behind it, one of the kitchens communicating directly with it, the superintendent's drawing-room also in the front, and behind it the girls' dayroom used only for changes of clothes, a sitting-room for the joint use of the schoolmistresses and the matron, a sewing-room and the girls' lavatory and their play-room. In the rear of the eastern half is a paved yard in which are the boys' offices, a small swimming bath, 33 feet by 12 feet, a carpenter's shop, and the boys' lavatory communicating with the entrance hall. In the rear of the kitchens is another yard containing coal- holes, a well-fitted laundry, and an engine and boiler-room, which supplies hot water for the kitchens, the laundry and the bath. On the first floor above the boys' lavatory are the boys' bathroom, and the superintendent's bathroom, and the eastern half contains three dormitories for the boys, containing respectively 12, 8, and 15 beds, a bedroom formerly used by the assistant-matron, but now by the matron's daughter, and the superintendent's lodgings, containing one large and one small bedroom, and two good nurseries; the remainder of the first floor is shut off by partitions and contains the schoolmistress's bedroom, two servants' bedrooms, and two dormitories for the girls, with 12 and 11 beds respectively. On the second floor, above the superintendent's lodgings, arc the schoolmaster's bedroom, lumber-room, store-room, and two boys' dormitories communicating with each other and containing respectively 9 and 6 beds, At the girls' end are the assistant-matron's room, a large store-room for linen, and a girls' dormitory with 12 beds, and 2 beds for servants within a partition. The girls are also provided with bathrooms, &c., like the boys. The sanatorium is separated from the eastern end of the main building by a large garden cultivated by the superintendent. It is a brick structure of one storey, and contains two wards each capable of holding about 7 beds, and each provided with offices and a housemaid's cupboard. They are separated by a small kitchen. All the rooms are tiled to the cornice. A small paved yard contains a wash-house and a coal-hole, and there is a mortuary in the rear. In a separate building and to the west of the main building is the school. It contains a large schoolroom and two class-rooms, one of which is fitted as a museum. All the rooms are tile-panelled. The playground surrounding it is cindered. From the back of this playground and the yards behind the main building the ground falls steeply to the Astley Brook and is well timbered. A natural terrace some way down and below the school playground has been levelled and enlarged so as to form a good cricket-ground by the superintendent, who, aided by the boys, has expended much labour and ingenuity in laying out, fencing, and planting the grounds, with excellent results. All the buildings stand well back from the public road, close to which is the lodge erected in 1884. The staff of the institution consists of a superintendent, a matron, an assistant matron, a schoolmaster, and a schoolmistress. The superintendent is Mr. F. Bignell. His wife is matron, and they receive a joint. salary of 150l. The assistant matron receives 23l. yearly. The schoolmaster. Mr. E. O. Gray, receives 70l., and the schoolmistress, Miss F. Bellamy, 40l., besides board and lodging. There is also a gymnastic instructor, who receives 21 guineas. The average number of children in the orphanage is about 80, of whom 50 are boys, these being given a preference because of the provision for girls already made by Dr. and Mrs. Chadwick's Charity. A preference is also given to orphans, but these only constitute about one-half of the total number. No child is admitted under the age of five, and the age of dismissal is 16. While in the orphanage, and of school age, the children attend the school, which is conducted as a public elementary school, and they are employed in various occupations about the premises, the boys assisting the superintendent in looking after his hen-runs and the grounds and greenhouses, and receiving instruction in wood-work, and being permitted for a short time before their dismissal to do odd jobs at houses in the neighbourhood; the girls receive instruction by turns in the laundry after they have left school. Upon leaving the orphanage the children are given an outfit and whatever they have earned, and are found good employment in trades. They are much in demand, and such employment is easily found. Occasionally the governors bind a boy or girl apprentice, but rarely, and very few children — only 14 out of 247 — have become clerks. For some time after they have left the orphanage the governors continue to exercise supervision over them. Of the rest of the 247 who have left the orphanage, 23 boys and 18 girls have returned while young to their friends, and have not since been traced; 48 boys and 4 girls have entered upon mechanical trades, 17 boys and 16 girls have become mill-hands, 17 boys and 40 girls have entered farm and domestic service, 13 boys and two girls are employed in shops, a few boys have entered the Army and Navy, and one boy has become an elementary school teacher. From 1951 to 1966, the site was occupied by the Isis independent school. Only the entrance Lodge now survives.